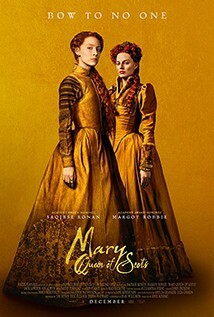 This historical epic explores the turbulent life of the charismatic Mary Stuart (Saoirse Ronan). Queen of France at 16 and widowed at 18, she returns to her native Scotland to reclaim her rightful throne. But Scotland and England fall under the rule of the compelling Elizabeth I (Margot Robbie). Each young Queen beholds her "sister" in fear and fascination. Determined to rule as much more than a figurehead, Mary asserts her claim to the English throne, threatening Elizabeth's sovereignty. Betrayal, rebellion, and conspiracies within each court imperil both thrones. We also see the romantic disaster of Mary’s seduction by the slyly drunken and decadent Lord Darnley (Jack Lowden), as desperate for a crown as Mary is for an heir to cement her claims. Pinballing between plotters, husbands, and her civil-warring half-brother Moray (James McArdle), Ronan’s quick-tempered, much-betrayed queen feels at the mercy of the men around her. In addition to providing ripe roles for the two lead actresses, the new film serves as the big-screen directorial debut for Rourke, the artistic director of London's renowned Donmar Warehouse Theatre Company.